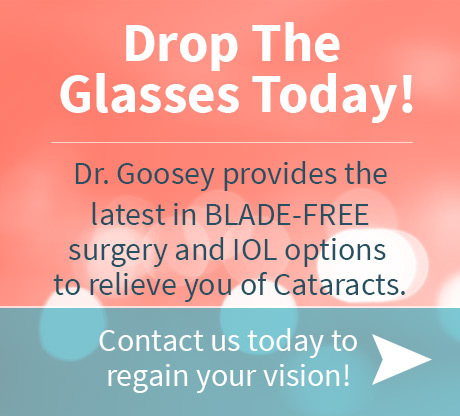 Cataract surgery has come a long way within the past decade or two, and premier eye surgeons like Dr. Goosey continue to advance along with innovative technology, including the advancements in IOLs or intraocular lens implants. Though there are a lot more lens options to choose from today, patients can count on Dr. Goosey to offer the latest in advanced cataract surgery technology. His choice to use only the most innovative lenses available today, adds to his unwavering commitment to excellence and quality patient care. Before intraocular lenses were developed, people had to wear thick glasses or special contact lenses to achieve good vision after cataract surgery. Today, with the technology behind modern IOLs, there are several brands of implants that will give you near the quality of vision you had in your twenties. Most intraocular lenses are made from a flexible and foldable material similar to plastic. Like the lenses in your eyeglasses, your implant will contain the correct prescription to give you the best possible vision. Some patients are more concerned with their distance vision, some with near, and most care about their ability to see both near and far. Please read on to learn more about how different intraocular lenses can correct specific vision problems. This type of IOL is designed to help patients see at various distances using different points of visual focus. They’re specifically designed for patients who would prefer not to have to wear glasses. This type of IOL is designed for patients with astigmatism in their corneas that is too great to correct with a limbal relaxing incision at the time of surgery. Patients have the option to use this type of lens for distance vision in both eyes, or a monovision treatment, and possibly reduce their dependence on glasses. This type of IOL has been used for several decades, and is the most common of all the different types of intraocular lenses. Monofocals are for patients who want good distance vision and don’t mind putting glasses on to see up-close. Dr. Goosey and his staff at Houston Eye Associates offers an array of multifocal, toric, and a few monofocal IOL options. To determine which option is right for you, be sure to schedule a consultation with Dr. Goosey prior to surgery. This is the latest technology available today in multifocal lens vision. Dr. Goosey offers this new line of innovative IOLs to patients because it provides clear high-quality vision that enables them to see at any distance. Learn more about TECNIS® Symfony IOL technology today, then contact our office for an appointment at 713-558-8777. Is a breakthrough lens that lets patients see both near and far. Dr. Goosey usually recommends this lens for patients who are more technology driven, and for those who spend a lot of time on a computer or iPad type device. We describe it to our patients as a lens for more of anintermediate range of vision. This is another highly-advanced lens that is proven to provide excellent vision at near and far distances, and under all lighting conditions. This lens, gives your younger vision back. Dr. Goosey typically recommends this lens to his patients who may do a lot of up-close work. This lens tends to work better for patients who still read paper books, magazines, or newspapers, compared to reading from a notebook or electronic device. Fluctuating vision, especially for reading in low light conditions. Initial sunbursts and halos around headlights & taillights- however, this improves over time. Continue to use the newly operated eye without glasses. Although it may be blurry sometimes, your brain needs time to adjust to the new vision. Your vision after surgery in only one eye will not be as good as your final vision with both eyes. The multifocal implants are meant to be used bilaterally. You will only achieve optimal vision after you have had the surgery in both eyes. Once both eyes have had surgery with multifocal lenses, your vision will be clearer for both distance and near. Be patient – learning to see with a new artificial lens can take some time. By far the best and latest toric intraocular lens, providing superior stability in the correction of astigmatism and advanced optics. Is an intraocular revolutionary lens that merges both the toric and multifocal technologies. Patients will be able to correct their astigmatism and presbyopia at the same time, without the need for additional refractive procedures like LASIK or PRK. This is a type of monofocal intraocular lens that corrects corneal astigmatism, but lacks the multifocal optics to facilitate both near and far distances. This is similar to the IOL above. This also a 1-piece monofocal lens, and is the first and only FDA-Approved Wavefront designed optic that rejuvenates vision by correcting spherical aberration to essentially zero. Monofocal lenses have a single point of focus, whether it is near or far, causing you to choose just one or the other. Only multifocal lenses can give you the near and far distances from the same lens. This is a 1-piece monofocal lens typically recommended for patients who are getting basic cataract surgery and are not concerned with becoming spectacle independent. Contact Dr. Goosey’s office at 713-558-8777 for an appointment.